When you are beggining the hunt for a local plumber in Carrolton, TX to provide you with quality plumbing service at an affordable price, you’ve come to the right place! Here at Flow Plumbing we have over 25 years of experience providing top quality plumbing service at reasonable prices to residents of the fine city of Carrolton Texas. Here at Flow Plumbing we are experets in all areas of plumbing and drain systems. We have earned a reputation for providing top quality service and completing repairs in a timely fashion, all at afforedable prices. We are interested in satisfying each and every customer, every single time. That is how we built our business over the last 25 years. Our dedicated, highly skilled team of plumbers can handle any type of plumbing repair, installation, or general plumbing service no matter the size. From the installation of a new hot water heater, to running new gas lines, to unclogging toilets, sinks, and drains. We do it all! We can clear drain lines, unclog sewer lines, repair broken or damaged pipes, and even detect, pinpoint, and repair slab leaks. We really do it all here at Flow Plumbing service in Carrolton! 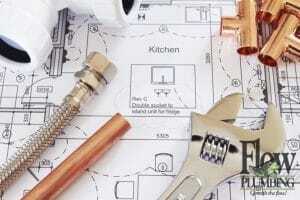 Need Fast & Affordable Plumbing Service in the Carrollton TX Area? If you set out today to find a quality Carrolton plumber that you can trust like your own family, Flow Plumbing is here to help. Since 1989 Flow Plumbing has sought to employ only the most skilled, professional, and courteous Carrolton plumbers. From general service to emergency repairs, we are available 5 days a wekk to serve you. We never use subcontracted plumbers and all of our staff is background checked, and drug screened! Give Flow Plumbing a call today at 214-338-8838 to schedule your plumbing service in Carrolton. We are standing by ready to help!